Lapel pins enhance any piece of clothing because they represent the wearer’s affiliation with a particular organisation or cause. Besides, it is a cost-effective solution to add an element of personalisation to your style statement. The creativity involved in the designing of custom lapel pins has come a long way over the past few decades. With the right tools, anyone can design attractive lapel pins to express their views, in a unique manner. Besides, customisation of the lapel pins no longer requires any prior experience as we help you to make it a hassle-free process. For the proliferation of every business organisation, strong brand presence and brand visibility are important. From the business point of view, lapel pins Australia can make a huge difference for your company as it helps you to create a perfect representation of your corporate logo. It also helps you to identify your employees and other officials at conferences, conventions, and exhibitions. Lapel pins are a great source of increasing your brand visibility, allowing your clients to relate your company with a particular product. Further, a custom lapel pin can be used to signify a number of achievements for sales team members and product development teams. Being part of a social group or community is an important aspect of civilian lifestyle. The symbols and emblems of every social group provide a distinction to each of its members. Within every social group and community, regardless of its size, denomination and geographic location, social communication and interactions play an important role. Lapel pins for each community and social group allow its members to connect to each other, share their thoughts and helps foster a sense of pride between themselves. Lapel pins also serve as a gesture to say thank you and appreciate the harmony within a society. It provides many opportunities for a social group to gain more visibility within the entire community and helps increase its members. Political campaigns involve the use of different strategies to solidify the support and improve candidate recognition among the masses. Through political figure pins, candidates can have their name or image featured on an enamel pin. Political campaigns can also feature Australian flag lapel pins to entice patriotism among the people. For voting purposes, distinct pins can be designed encouraging the people to exercise their constitutional right to vote. Besides, voting pins can be created to prompt the people to vote for a particular candidate as well. If you can phrase a short and powerful statement of your political views into an enticing metal pin, it can make a difference if worn publicly. Similarly, humour has played an important role in the politics. You can create a funny political pin that helps you gain support of the people by resonating your ideas with the populace. Within every society, people come together when faced with any social or economic challenge. Awareness education becomes important to educate people about important issues and to show their support to make a change. The symbols for such causes become recognisable and are essential to keep important causes in the public eye. Custom lapel pins are an effective way of spreading attention, awareness, and your message out in the community. They serve as effective advertisements and reminders of an impending issue, which needs to be presented before the masses. Every school, university or an educational university has a unique identity that is duly reflected by the symbols and emblems worn by the students, staff, and other members at important gatherings, events, and occasions. The symbols reflect the identity, fraternity, sorority, and designation of the members within an institution. By using a custom lapel pin, schools and universities can promote themselves in an effective manner. Through lapel pins, students or members of an institution can be easily recognised at an event where delegates from several institutes are present. Sporting events are a part of every culture and society. Games and sporting events provide a platform for people from all age groups to come together and support their favourite teams. Custom sports lapel pins are designed in attractive forms to help fans support their favourite teams at leading sports events and tournaments. Whether a team plays basketball, cricket, football or hockey, custom lapel pins provide a comprehensive coverage of every major sporting event. For sports teams and clubs, lapel pins also provide a distinct identity to the support staff, and volunteers working for a specific sporting event. Historically, lapel pins have been an important part of various important events, places, and people. 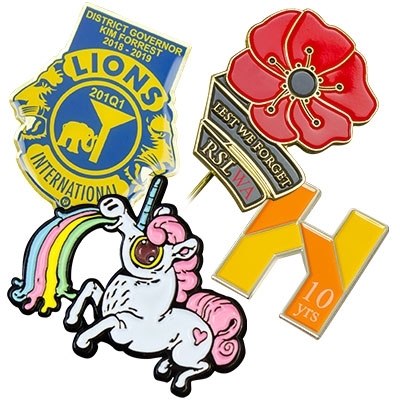 Custom lapel pins have been used from ages in the form of promotional items. As an important part of the employee recognition program, customised lapel pins can be used to signify different employee achievements. Specific lapel pins can be used to represent rewards, milestones, and successful completion of a project. Such initiatives are essential to take your business to the next level. If you’re a business company, non-profit organisation or a sports team, your logo can be used to create a distinct promotional lapel pin. Boutonniere: The boutonniere is designed for formal purposes. Typically, it is a floral pin which is tucked into the buttonhole of your jacket. From weddings to special ceremonies, boutonnieres can be effortlessly worn for everyday occasions, as well. Long-Stem pin: The long-stem pins are made from metals such as gold, copper, and silver. These type of lapel pins have a stick attachment that provides them a distinguishing appeal. Badge or Mini-Pin: The mini-pin is one of the most popular types of lapel pins. Typically used by the military or in political and charitable campaigns, the badges are often enamelled with precious stones and gems. You can also check out the distinct range of custom lapel options offered by us here at the Pin Factory. The die struck pins are created by striking a die of the client's custom design onto a sheet of thin metal. This stamped metal will, as a result, have areas that are recessed or raised to make it easy to plate the pin with silver or gold. This variety of pin is ideal for clients who want a colourless pin that makes an elegant statement. Those ordering custom-designed pins can choose to have the lower recessed areas sandblasted for added visual impact as well. Enamel pins come in two varieties. Soft enamel pins are easily the most popular product in the custom lapel marketplace. Their fabrication process is similar to die struck pins, except instead of sandblasting, or silver and gold plating, the recessed areas of the pin are coloured using enamel paint. The enamel then settles into all of the grooves as the pin slowly air dries. Allowing the paint to settle creates a distinct visual appeal. Since the metal die employs raised borders, the combination of texture and color give the pins their characteristic three-dimensional effect. Hard enamel pins are made in almost exactly the same way except that heat is applied during the enamel hardening process. This creates a smooth and polished look and leaves the paint and the metal borders of the die on the same level. The extra drying process makes hard enamel pins slightly more expensive than their soft enamel counterparts. However, most customers find they are worth the extra money, particularly when they are intended as gifts for employees or valued clients. Die cast lapel pins are much less common than die struck and enamel pins. This is because their creation process is more complex, which raises their price significantly. Die cast pins are made by creating a mould of the desired design, then pouring hot metal into it. As a result, much more complicated designs and completely custom shapes can be replicated accurately and effectively. If a clear silhouette is essential to the design of the pin, die casting is the way to go. Printed finish lapel pins are created by placing an offset printed design onto vinyl, then covering the whole thing with a clear dome. Companies or organizations with extremely complicated and difficult-to-replicate logos sometimes find this method is more practical. It is also a better fit for art that requires the replication of a good deal of detail or colour gradients for each pin. Unlike both die cast and die struck pins, there is no metal line between the different colours. If the lapel pin is made up of a precious metal such as gold or silver, make sure it is well-matched with your belt buckle and cufflinks. If the lapel pin is colourful, make sure it matches the pocket square or the tie. To wear the lapel pin for a sporting event, make sure it is well pinned to your sports coat. It is important to consider some useful guidelines to correctly place the lapel pin. Lapel pins are always attached on the left lapel. The buttonholes on the lapels are specifically placed to attach lapel pins. Hence, it is essential to place the lapel pin just inside the buttonhole. Certain lapels have a small piece of fabric attached under the buttonhole. The purpose of this fabric is to hold the stem of a long-stem lapel pin. With A Tuxedo: Suit lapel pins add a grace to your attire. Typically, boutonnieres go well with the tuxedos. Men’s lapel pins may also include a symbol. For A Wedding: Typically, the flower lapel pins suit the bride. Whereas, the grooms and groomsmen should prefer boutonnieres. While other guests can choose any lapel pin to decorate their jackets. For A Corporate Event: For specific events like inaugurations, exhibitions, and fares, lapel pins must match the theme and style of the particular company or business you are representing. Lapel pins must be straightforward in design without being too extravagant. By using enamel lapel pins, you can increase the brand visibility of your business. Customised enamel badges must be worn individually. Wearing more than one lapel pin can make your appearance look cluttered. It also distracts the attention of people on each badge and prevents the accurate delivery of the brand message. Each lapel pin serves a purpose. Hence, it is important to carefully choose the one which best fits the occasion or event you’re going to attend. Business organisations make their own custom lapel pins, and require their employees to wear them whenever they are representing their brand. It is important for the companies to ensure that the custom lapel pins must complement with the employee uniforms to maintain conformity and promote brand recognition. To buy lapel pins across Australia, you can avail our streamlined services. After selecting the required design of a custom lapel pin, you just need to directly place a call to request a quote. Our customer service executives provide comprehensive detailing and explanation of the different production methods involved in the production of custom lapel pins Australia. If a customer is uncertain and unable to select the appropriate type of lapel pin, our expert custom pin designers provide comprehensive assistance to help in decision making. Our design services are entirely free, though there may be some moulding charges depending upon the type of pin chosen. After the completion of every design, our team sends it directly to the customer’s email for approval. If you require any changes or modifications in the design, we provide free revisions to our clients. Once the order is put into production, customers just need to wait for a couple of days as we directly deliver new lapel pins Australia to their doorsteps! The Pin Factory provides comprehensive custom lapel pin services delivered right across Australia.